Floor monitors are a necessary evil, but I loathe spending much money on them as they are not what the audience hears. Then again, if I cheap out on them they are going to work like crap and the guys on stage are going to be chapped at me. Well, since I have made the switch to powered PA speakers, I have been trying out different powered floor monitors, and thought I would pass along my thoughts on the Peavey PV 15PM powered floor monitors. Peavey has been around since 1965, and is one of the biggest manufacturers of amplifiers and speakers. 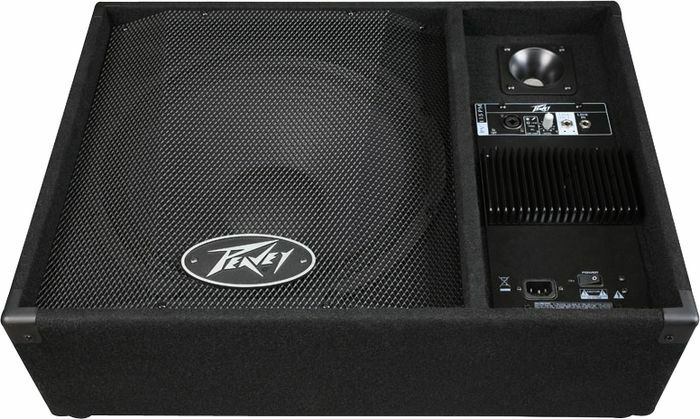 My fist bass amplifier was a Peavey, and most every musician I know has owned or used Peavey equipment before. And these look the part, covered in carpet with heavy-duty steel handles and a steel grill. They measure about 26 inches wide by 19 inches deep, with a 40-degree upward angle. They are not lightweight, coming in at around 47 pounds each. No plastic in these bad boys. They are loaded up with a 15-inch Peavey speaker with a 2-3/8-inch voice coil and a neodymium magnet and a 1.4” titanium diaphragm compression driver. Power is supplied by a pair of class D amplifier that are bi-amped to provide a total output of 200 watts (150 to the woofer and 50 to the tweeter). Peavey does not say if that is peak, but it seems to me like continuous power, just from how loud they are. And they are rated up to 120dB by Peavey, with a frequency response of 52 Hz to 21 kHz. Everything is loaded on the face of the cabinet, which is something I appreciate as I hate fumbling around with wiring on the back of floor speakers. This includes a combo jack with ¼” TRS and female XLR microphone or line-level balanced input, two ¼” phone jacks for link-out/direct-in capability, the power switch, a level control, a ground lift and a pad switch. And these Peavey floor monitors work great. They look nice and seem sturdy enough that they will last forever. They have decent lows and cut through on stage with a loud drummer. But they don’t do much of anything better than the Mackie Thump speakers I have been using for monitors, and that is a problem. The Mackies sound just as good, are much cheaper, have a higher power rating (400w), and weigh a lot less (under 30 pounds). Plus they can also be set on their sides for floor use or mounted normally on stands. New Mackie Thumps will run you about 300 bucks each, while the Peavey PV 15PM speakers have a street price of $400 (list price is $479). Try them both out and do the math, and as nice as they are, you will probably not end up with the Peaveys. Everybody and their brother makes a tuner pedal these days, and you can pick up most of them for under a hundred bucks, and clip-on tuners are so cheap that you can usually get one thrown in for free when you buy a new guitar. So when I saw the price of the Peterson VSS-C Stomp Classic Strobotuner, I was taken aback. It has a list price of $299 and a street price of $205. That is a lot of simoleons for a man of simple means, but it is one gnarly tuner. You have probably seen the old Conn ST-11 strobotuners before – I remember the day our school orchestra got one back in 1980 or so, and it transformed my ideas about tuning. The Conn tuner uses a wheel that shows different octaves and the strobe effect of the tuner will make one row of the wheel appear to stop for the octave that is being played, while the overtones for other octaves will move about depending on how far they are out of whack. The advantages of this are incredible accuracy (within 0.1 cent), along with an intangible coolness factor. The Peterson VSS-C Stomp simulates all of this with a nice bright LCD display that is a little simpler to look at and use. The pedal itself is normal sized, measuring 5 ¼ by 3 ¼ by 2 ¼ inches, but it is a brick, weighing in at around a pound. The die-cast chassis had built-in lugs for secure pedal board mounting, which is good as a strip of Velcro might not hold it in place. There is also a built-in cable guard to keep them from getting damaged. It has a very sturdy feel and Peterson backs it with a 3-year warranty, which I would expect at this price point. It uses one 9-volt battery, or you can use an AC adaptor (it draws 80mA). This tuner has the usual Switchcraft ¼-inch in and outputs, but there is also a balanced XLR output, so the pedal can be used as a mutable active DI with user-selectable 3-stage attenuation. A USB port is provided to download new presets, if you find that the 23 preloaded ones are not sufficient. The specs look really good on paper, with 100% true-bypass circuitry and a tuning range of 8Hz (go III-X!) to 8000Hz. The accuracy is guaranteed to be within 0.1 cent, and A 440Hz is adjustable from 390Hz to 490Hz. The Stomp Classic delivers on all of this, and it is easy to use for conventional tunings. It adds no noise to my signal chain, and there is no pop when the switch is pressed. Not to mention that the display is plenty bright for most any environment, and it will hold notes for longer than any other tuner I have tried. It is the best tuner pedal I have ever used. No doubt. As an added bonus they include the 23 preset “Sweetened Tunings” (terrible name, by the way) that include specific programming for less common instruments such as the electric violin, 7 string guitars and mandolins, that take into account string deflection and unique harmonics to make tuning as accurate as possible. I use almost none of these presets, by the way. 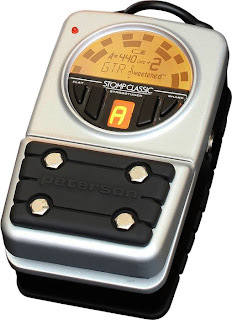 So, I guess I am saying that the Peterson VSS-C Stomp Classic Strobotuner is worth every penny of the $205, but I would happily give up the programmability and the DI to get a tuner that was this accurate and well-built, for a few less bucks. Even in its current configuration you will not go wrong if you purchase this tuner – it is the best one on the market, and they guarantee it. Wendy DeWitt, “The Queen of Boogie Woogie,” is from Northern California and supplies the piano expertise and vocals for this project. She has been in the business since the 1980s, both with her own band as well as working with legends such as Otis Rush, Hank Ballard and Sam Moore. Her piano has plenty of Otis Spann and Tommy Thomsen influence, and though I am pretty sure there is more than one self-proclaimed queen of boogie-woogie, with this pedigree Wendy has as much right to sit on the throne as any of them. 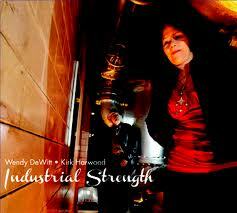 Industrial Strength not only shows off Wendy’s piano prowess and vocal chops but also her creativity, as she has provided nine original tracks for this album. The album kicks off with “Nervous,” a good example of a Wendy DeWitt instrumental that is a timeless tune that could have been performed in the 1950s or just yesterday. It sets the tone for the album by displaying her mad piano skills and the perfect interplay between her and Kirk Harwood. There is a similar them on the two cover instrumentals, “Boogie Woogie Stomp” by Albert Ammons and “Bass Key Boogie” from the legendary Eurreal Wilford “Little Brother” Montgomery. The Gershwin standard “Summertime” comes up next, and this is a version like you have never heard before. It is a fast tempo mash-up that starts with “Flight of the Bumblebee” as the intro before Ms. DeWitt starts her smoky vocals. Nancy Wright (again from the San Francisco area) joins in on the saxophone, and she blows a huge sounding horn. I groaned a little when I saw this song on the CD package, but their fresh take on it blew me away. Industrial Strength is not entirely high-energy boogie-woogie, and it is sweet that DeWitt and Harwood slow things down and provide heartfelt soul tracks too. “Lucky Old Sun” is performed to a standard that rivals Louis Armstrong’s version, and provides tasteful guitar work from Anthony Paule. Another guitar ace, Steve Freund, can be found filling out “If I Could Just” which is a beautiful original ballad. A few other notable guest guitarists make appearances on this album. Norton Buffalo alumnus Dave Aguilar also throws in a few licks and tears it up on the straight-up blues tune, “It’s Too Late.” And Wendy’s mentor Tommy Thomsen throws a little swing picking around on “Wings of Love.” This is neat stuff! The most fun track on Industrial Strength has to be “Love and Appreciation,” which has a bit of everything in it, including a little whistling, some jaunty and clever lyrics, and Marty Eggers on tuba. You don’t get much tuba in today’s popular music, it seems. After the up tempo instrumental “San Francisco” the album slows to the finish with “Gone” which is a baleful lament of friends who have moved on. Steve Freund comes back for this closer and his guitar provides a great counterpoint to Wendy’s voice. That man has soul oozing out of his fingertips. 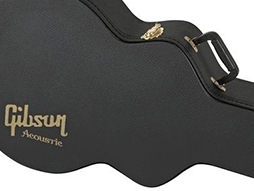 For years I have been very disappointed with the playability of new Gibson electric guitars, but have never really used any of their acoustic guitars. But, I recently had the opportunity to play a Gibson Hummingbird Pro EC acoustic-electric guitar for a few weeks, and thought I would share my thoughts on it, because it is a pretty neat guitar. 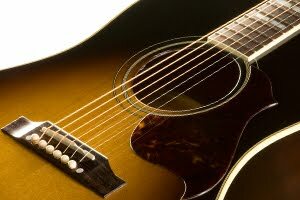 Introduced in 1960, the Hummingbird was Gibson’s first square-shouldered dreadnought, and is an iconic guitar that has been played by oodles of popular artists over the years. The American-made Pro EC model we are looking at here is exclusively sold through Guitar Center and their Musician’s Friend website. These guitars are different than the traditional Hummingbird guitars. The Pro EC is a cutaway guitar (a non-cutaway version is also available), and the body shape falls somewhere between a square-shoulder dreadnought (like the Hummingbird Modern Classic) and a round-shoulder dreadnought (think J-45). There is also no signature Hummingbird pickguard, so I am not even sure why they continue to call it one. The Pro EC comes in about $950 cheaper than the standard models. The body has a Sitka spruce top with solid mahogany sides and back and the whole thing is sprayed with a thin nitrocellulose vintage sunburst finish. The builders did a fantastic job on the rosette inlay, white must be made of 10 concentric pieces. Like their other models, the Pro EC has scalloped and radiused top bracing. And like the original Hummingbird (and the original J-30), this model has an X brace to provide a balanced tone. As I said before it is a cutaway so there is really nice access to the frets that I never use. The neck is the best part of this guitar, and it plays better than any new Les Paul I have tried -- they got the frets level on this one and it is super comfortable and beefy. It has a glued dovetail joint with the body, so there are no bolts involved and it has a solid feel to it. There is a 1.68-inch wide nut and a 12-inch fretboard radius with a nicely-rounded profile to the back. It has a 25 ½-inch scale and 20 frets sunk into its rosewood fretboard, along with the ever-popular mother of pearl split-parallelogram inlays. 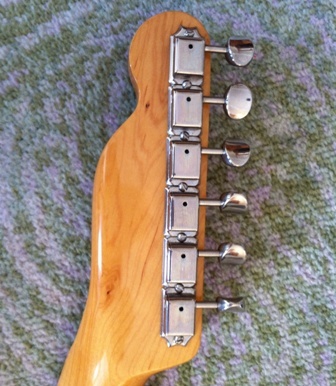 The neck is bound, with the binding extending over the fret ends. The headstock has the crown inlay that Gibson has been using since the 1940s. 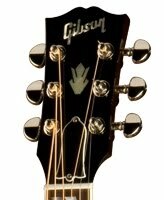 The back of the headstock looks exactly like the ones on other Gibson models that break if you look at them funny. Well, a quick search on the internet showed that almost every used Hummingbird Pro that is up for sale has a repaired headstock joint. Hmmmm. The factory installed Grover Rotomatic tuners, which are a nice choice. They have a 14:1 ratio so they are very precise, and they really hold nicely. 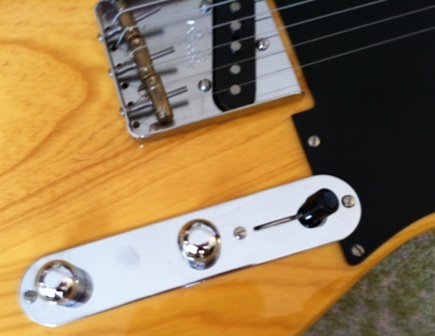 A helpful extra is that these tuners have user-adjustable tension, using a countersunk screw. And there is a great electronics package too. The Hummingbird Pro with the cutaway body comes with the Fishman Prefix Plus-T preamp system. This system has volume, Bass, treble and semi-parametric contour controls, as well as a brilliance control, a Phase switch and a notch filter. Oh, and an on-board chromatic tuner too. By the way, the non-cutaway model gets the L.R. Baggs Element Active pickup system, which I have not had the opportunity to try out. These things all combine together to make a very good guitar that plays well and sounds great. The thick neck might not be for everyone, but it is smooth and there is not fret buzz. The tone is well balanced with a bit of a bias towards the low end, making this a very full-sounding instrument with a high end that can still ring like a bell. The electronics sound very natural with no added noise, and there enough adjustments available to really dial in the tone. This guitar sounds great when played through an amplifier or directly into a PA. It is a viable alternative to a Martin dreadnought, for sure, and it is easy on the eyes too. Though it is cheaper than the standard models, the Hummingbird Pro EC cutaway is still pretty spendy with a list price of $3599, and a street price of $2299, which includes a nice TKL/Gibson hardshell case. As I said, these guitars are only available through Guitar Center or Musician’s Friend and they both have good return policies, so it might be worth trying one of these out and comparing it to a Martin before making your final decision. If you have been reading my blog for awhile, you may know of my respect for the Shure SM58 microphone, and I am not the only one that feels this way. Everywhere you go you see the SM58, and it has to be one of the popular microphones on the planet, particularly for live performance. 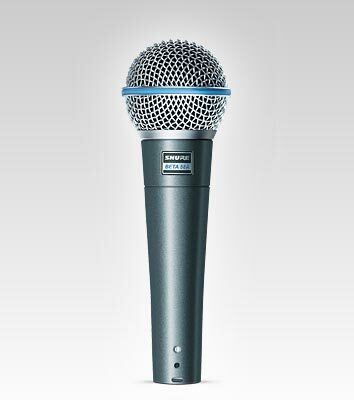 But Shure also makes a premium version, the Beta 58A. This microphone is also quite popular, and many people say it is better, but many times they cannot give good reasons why, so I thought I would put some time into comparing them. The first thing to keep in mind is that the Beta 58A and SM58 were designed as (and are marketed as) vocal microphones for live performance. If you are using these to mic bass drums, or if you are expecting these microphones to do something different you should be shopping for something else. The appearance of the Beta is not terribly different from the SM58, and the quickest way to tell the difference is to look for the blue band around the grille. The body is also a little different color (more blue than gray), and there is a little square badge on the Beta. The weights of the two are within an ounce of each other, so that is a wash. The performance numbers between the microphones are similar, and the impedance is 150ohms for both of them. 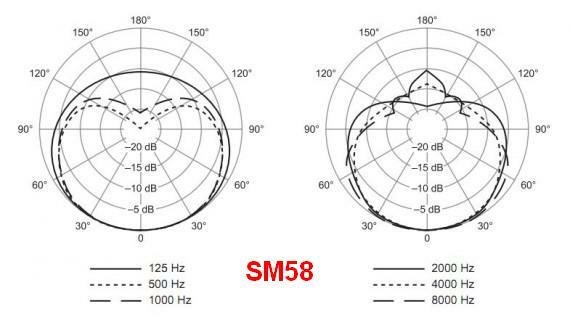 The frequency response is 40 to 15,000Hz for the SM58 and 50 to 16,000Hz for the Beta 58A. The frequency curve drops off less on the high end for the Beta, meaning it should sound a bit brighter (and it does). The construction is also a little different. The grill is stronger (made of hardened steel), so it is more resistant to damage. The innards are still shock-mounted, which is a good thing and Betas seem to be just as reliable as the SM58. 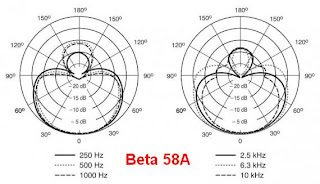 The Beta 58A goes to a neodymium magnet for higher output than the SM58, which is one of the major physical differences between he two. This higher output means that less gain is needed on the pre-amplifier, which helps reduce feedback, particularly if the singer is close to the monitors. 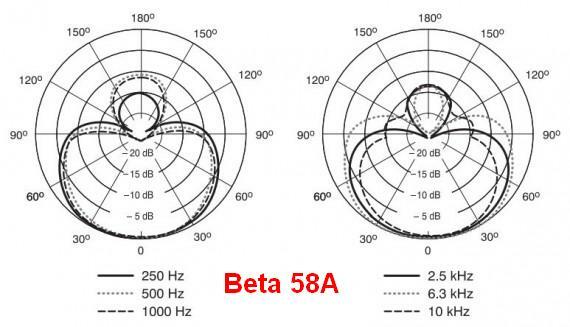 The Beta 58A has a different polar pattern to make it better for live sound situations. The super-cardioid pattern (see the pattern images below) helps separate the vocals better from the panoply of other sounds that occur on stage. 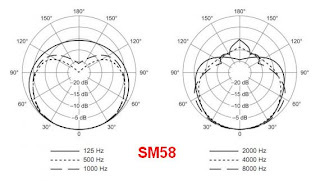 The SM58 has a cardioids pattern, which is also good on stage, but because it does not have as tight of a pattern it is more prone to feedback. The higher output and brightness are the biggest selling points for the Beta 58A over the SM58 and if you are going to be using your microphones mostly on noisy stages, the Beta will edge out the SM58 as its cuts much better through a dense mix. But, the higher output and brightness of the Beta 58A come at a price, and that price is that this is a harsh sounding microphone. When a singer brings their own Beta 58A microphone I have to do a lot more fiddling with the EQ and level to get them to sound good. I prefer the SM58 for public address or smaller gig settings, and would always pick an SM58 over the Beta for studio vocals. I have tried both in the real world and as a result I have no Beta 58As in my microphone case, only SM57s and SM58s. I can buy three of those for the price of two Betas, and the extra cost is just too much after considering the advantages and disadvantages of the Beta 58A. As I said earlier, the Shure Beta 58A is about 50% more expensive than an SM58. These microphones have a list price of $199, and a street price of $159. If you are going to purchase one of these I would stick with a major retailer, and be wary of online or craigslist deals that are too good to be true. Due to the popularity of Shure products, they are being counterfeited, and you don’t want to get burned. Today we are looking at a weird bass that raises plenty of questions and does not provide a lot of answers. Weird or not, it is a great bass, and a nice looking thing, too. I bought this online awhile back, and the seller did not know the history of it, so I will just present the facts about the bits and pieces that make it up. The body is alder (I believe) with a lovely bookmatched maple top that is bound with faux tortoiseshell. The whole body is finished in two-tone tobacco sunburts. It had a Precision Bass shape with a slab profile to the front, and a belly contour on the back. It has an ESP stamp in the neck pocket, and a pencil date of 6-30-83. This is a real ESP body. The neck is the real deal too, with an ESP headstock shape and a precision-width nut. It is maple with an ebony fretboard and 20 hefty frets. 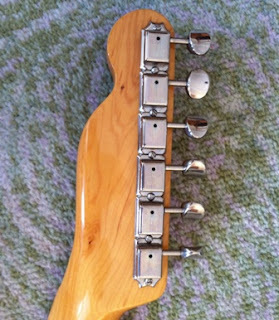 This neck cannot be original to the body, though, as this headstock shape was not used in 1983, and there was some crude filing done at the end of the neck to make it fit the neck pocket. Also, there is no route in the body to access the truss rod, so it is a little chewed up. The guys at ESP do nicer work than this. The hardware is all gold-plated ESP equipment, with a detuner on the E string that was probably added later. The brass bridge is hefty, and the neck plate is just marked “ESP” with no serial number. As a matter of fact, there are no serial numbers anywhere on this bass. The electronics are all factory stuff, with P-J pickups marked with ESP logos, and a 9-volt active electronics system. The controls are simple with volume and tone controls, and a 3-way selector switch. All of these parts come together to make a very nice-playing bass that looks good too. The P-J pickup configuration makes it very versatile and the active electronics give it a nice rock edge. So what is the big mystery? When I went to change the battery, I found a “Property of Aerosmith” inventory tag on the back of the control cover. This was not sold to me as being celebrity-owned, so I do not know the real story. It does seem that a guy who gets his basses for free (and who used to be an ESP endorsee) might have Frankesteined a couple of basses together to make a new bass. I will probably never find out the true story, but in the mean time I got a great bass for short money. I think I will get the neck fitted better to the body, yank off that detuner and hold onto this one for awhile. It is hard to find better-made basses than the ones that Roger Sadowsky’s crew builds in his New York City shop. These instrument s are beautifully constructed, play like a dream and sound like the thunder of the gods. But, they are super expensive ($3500 and up) and if you want something built to your specification it will surely cost more and it will take at least six months to get one. Who has that kind of patience? There are ways us mortal men to get our hands on a Sadowsky for a more reasonable price, and that would by with his Metro series of basses. These beauties are built overseas by some of the best luthiers in Japan, the land of the finest craftsmen on the planet. These basses use the same electronics and hardware as the NYC basses, but with cheaper bodies and necks. I imagine that there are some advantages to getting away from onerous American bureaucratic policies, too. The bass we are looking at today is a Sadowsky Metro MV4-HPJ. This instrument combines the best of all bass features, with a Precision Bass body shape, a Jazz Bass profile neck, and my favorite pickup combination: a P and a J. It is a lovely lass gorgeous with a crystal clear ’59 Burst finish showing off the fat grain on the ash body. This is a solid body, not chambered like a NYC bass so it comes in at around 10 pounds, which is a couple of pounds more than an NYC bass. You do get something for your money. The blindingly-white maple neck does not have graphite reinforcement strips, so that is another difference between these and Sadowsky’s recent US-production basses, which have two. There are 21 jewel-like frets lovingly settled into the fretboard. Sadowsky says that these use the same electronics as the New York City basses, so it has Sadowsky humcancelling coil pickups, and the much-copied Sadowsky pre-amplifier with Vintage Tone Control. 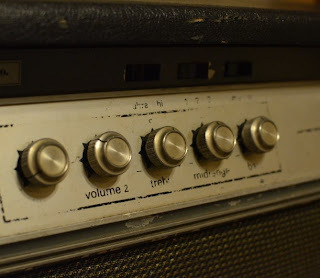 The knobs are: volume / pickup pan / vintage tone and preamp bypass / stacked treble and bass boost. I have had the opportunity to compare these basses to real NYC basses, and they do not sound quite the same, but are still very good. Maybe it is the wood they use for the bodies that make them sound different. Maybe it is just psychological. This made in Japan Sadowsky MV4-HPJ is just a lovely bass. It sounds, looks and plays like a high-dollar custom bass. The construction is flawless, and the neck and fretwork are perfect. It is better quality than anything Fender or their Custom Shop is producing today. Metro basses come in the same Sadowsky semi-hard case that the New York City basses used to come in. The MV4-HPJ sells for $2425 new, and Sadowsky does not allow their dealers to discount these at all (but one dealer sells them for $2100 anyway). Nice used ones run around $1700 to $1800. 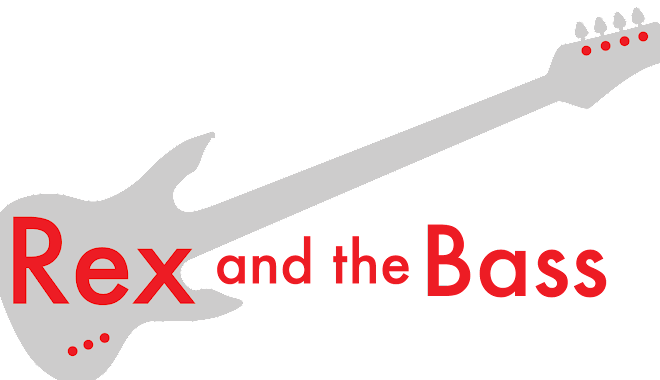 I am a sucker for clever band names and Microwave Dave and the Nukes is a winning handle that gives a hint of the good times music they play. Good times abound on their seventh album, Last Time I Saw You, which is mostly blues-based music, but ends up having a little bit of everything in it. Don’t worry though, because all of these songs groove. There are ten original tracks, along with two cover tunes and a bonus track of mechanical noise (an automotive winch, or so I have been told). Much of the original material is written by guitarist and vocalist “Microwave” Dave Gallaher, who founded this group in 1989. The Nukes consist of James Irvin on drums and Rick Godfrey on the bass and harp, completing this Alabama-based trio; all three are all accomplished bluesmen and first-rate musicians. Last Time I Saw You kicks off with “Drinkin’ Wine Since Nine”, which grinds but (like all liquor-themed songs) does not have the most intellectual lyrics. If you were not previously familiar with the band, this delta-inspired track provides a perfect introduction for Dave’s growly voice and dirty slide guitar work, as well as the tight and adventuresome duo of Irvin and Godfrey. As I said earlier, there is a little bit of everything in Last Time I Saw You, and the second track “Jesus was Smart”, shifts into a countrified shuffle and provides the listeners with some clever and smart-alecky lyrics. And the surprises just keep on coming. I have been listening to blues for a while now, and cannot remember the last time I heard a full-fledged lengthy bass solo on a blues album, but “I’ve got a Bet with Myself” delivers one, along with a fine selection of AC/DC to ZZ Top uptempo rock riffs. The journey through the album finally slows down for a lovely blues ballad, “The Worst Thing” which provides Dave with the opportunity to show off some truly soulful guitar work. His voice and guitar work magically together. I cannot resist the Billy C. Farlow cover tune, “Alabama Saturday Night”, which has a tough Bo Diddley beat to it, thanks in no small part to the thumping drums laid down by James Irvin and some pretty sweet harp work by Godfrey. “All Night Boogie” is indeed a boogie, and features impressive Keith Moon-esque drumming throughout, almost like a drum solo that happens to have a blues song happening on top of it. James Irvin is very talented, and his playing throughout Last Time I Saw You is considerably more complicated than what is found on more conventional blues albums. This song has really stuck with me and is my favorite on the album, so kudos for doing something a little bit differently, gentlemen. Heading into the final half of Last Time I Saw You, there are twists and turns through the influences of the Appalachians, and possibly Memphis, before things get decidedly weird (in a good way). You will see what I mean, because as the album ends, it takes a couple of unexpected turns, first with “Vagabundos”, a surf tune with Gallaher providing Spanish vocals in his distinctive baritone, and then with “Rafferty”, a 7-minute AOR instrumental that is amazingly melodic . 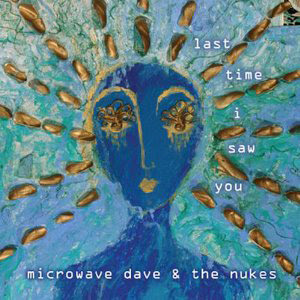 Microwave Dave and the Nukes have provided a little something for everybody on this album, and it is quite a trip! By now you probably realize that this is not strictly a blues album, but overall is great entertainment and a lot of these songs have made it onto the playlist I am putting together for my next party. I think Last Time I Saw You will appeal to most blues followers, and I think you should give it a listen. 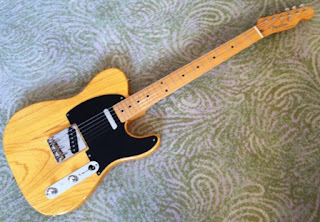 By now, you all know that I love both Telecasters and Japanese guitars, so when those two planets align I must be in heaven. Check out today’s answer to my prayers: a Japan-built Fender TL52-80 Telecaster. 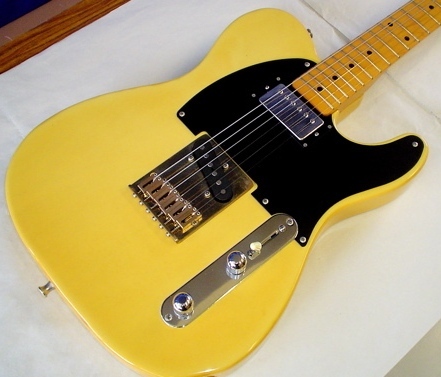 This is a fairly faithful recreation of a 1952 Telecaster, and gives the performance of the American-made reissues at a fraction of the cost. 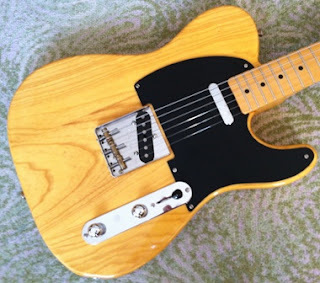 I picked this non-export model on a business trip to Japan, and will be selling it pretty soon as I recently happened upon a factory “Micawber” Tele. As this is a model TL52-80, it is one of the more expensive models. The “80” in the name designates 80,000 Yen, which is a little over a thousand bucks right now. And Japanese music shops don’t bargain much from list price. 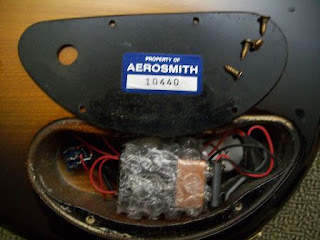 The serial number on the back of the neck has a Q Crafted in Japan prefix, dating this to 2003 (or so) according to Fender’s website. Do not be distracted by the extra serial number on the bridge. Every 52 RI Japanese Tele I have seen has an extra A-prefix serial number stamped into the bridge. This one has a stunning transparent finish over the ash body. There must be a lot of quality injected into that wood, because this is a pretty heavy guitar, weighing more than my Les Paul. Wow. The neck is a peach with a period-correct water transfer label and a v-profile. The frets are normal-size and are very well finished. The neck pocket to body fit is very precise, showing the fine craftsmanship that went into building this instrument. The hardware is faithful, with a classy single-ply black pickguard, and a traditional tele bridge with 3 brass saddles. The tuners are the vintage in-line type, and they hold fine. 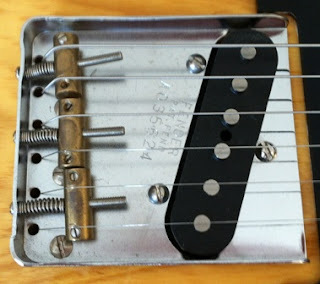 In keeping with the 1952 Tele these, there are flat head screws everywhere, and not a single Phillips head in sight. 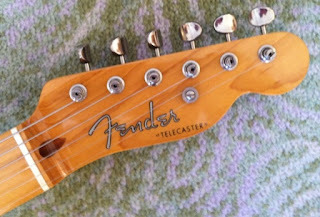 The pickups appear to be original to the guitar, but I am not sure if they are from Fender Japan or Fender USA. They sound great, and this thing will kill any Stratocaster on the block. Taking the control cover off, you will find that this is wired like a modern tele, but still uses vintage-type cloth-covered wiring. 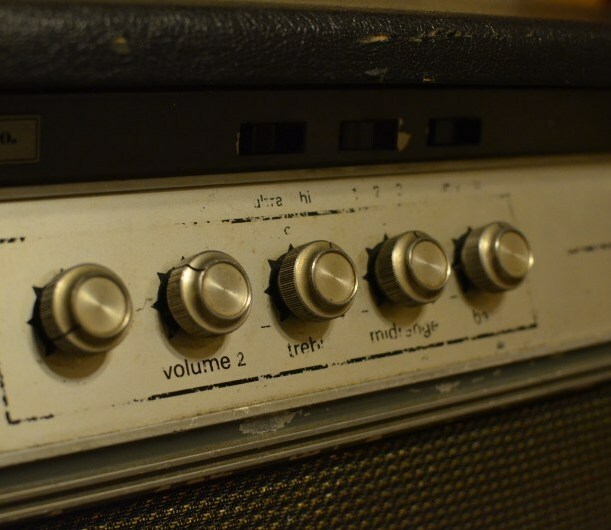 Until earlier this year I had used the same bass amplifier for a few years with no yearning for anything different, and I had become complacent about my tone. Then I got bitten by the tube bug, and I slid into a deal on an Ampeg SVT and an 810 cabinet. 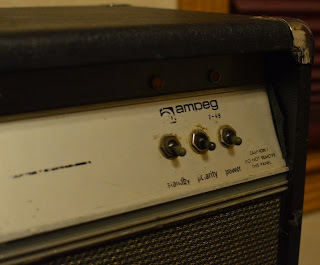 Things only got worse when a friend of mine offered up an early 1970s Ampeg V-4B bass amplifier head. I may be hooked. The original run of Ampeg V-4B amplifiers was sold from 1971 to 1980, and were the sibling of the popular V-4 guitar amplifiers. There are a lot of similarities between the two, with the biggest differences being the lack of a reverb and master tone volume on the V-4B. These are popular amplifiers, but still can be found a bit cheaper than their contemporary SVTs. The V-4B is a two-channel 100-watt all-tube amplifier, and was originally equipped with a passel of tubes, including: four 7027A power tubes, one 12AU7 driver tube, one 12DW7 preamp tube and two 12AX7 preamp tubes. Of course people replace tubes over the years, but these are the ones that should be in there. With all of this hardware and other related bits (transformer/power supply) they are pretty hefty, coming in around 65 pounds or so – a bit lighter than an SVT. On the front of the head you will find two inputs (two channels), Volume 1 & Volume 2 knobs, Treble, Midrange & Bass knobs, and three switches for standby, polarity and power. There are also toggle switches about the equalizer knobs for Ultra Hi boost, three Midrange boost settings and Ultra Low boost. On the back are speaker and external speaker outs, an impedance switch (2/4/8 ohm), two external amp outs, and AC outlet (really?) and a hum balance screw. Any this all combines to make a neat amp. With all-tube power, 100 watts is plenty for most any venue. The V-4B will push my 810 loud enough that it makes me wince. Its tones are versatile: there is ample low end with a creamy tone that is sweeter than my newer SVT, but it still can get more than growly when I start to push it, making it a great rock amplifier. The only downside to this thing (if you can stand the weight), is that it is wider than any of the cabinets I own (even my Ampeg 810), so it looks kind of goofy sitting on top of the stack. Mine shows plenty of wear, with torn tolex, a missing logo and most of the silk-screening worn off the control plate. But it still plays marvelously, and I consider it a keeper. Well, as much as anything that I own is a keeper, anyway. There are not as many V-4Bs for sale as there are SVTs, but the prices are still reasonable: maybe $600 or $700 for a nice one. 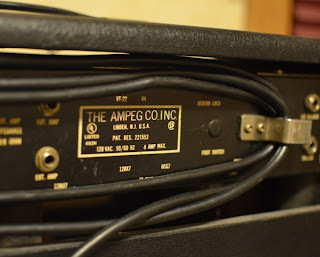 Of course, these amplifiers are old and have a ton of electricity coursing through them, so if you pick one up make sure to get it checked out by an amp technician to make sure it is not going to kill you. You might want to recap it and make sure the power supply is up to snuff. 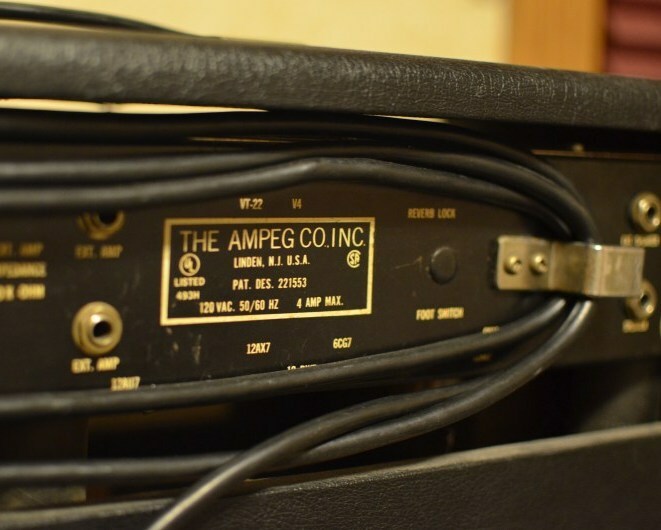 Anyway, check an Ampeg V-4B out if you get a chance – you will find it to be a viable alternative to an SVT if you are not playing at the Coliseum. It is worth the weight! What is in Rex’s garage this month? Things have changed around quite a bit since my last update, and I am going to have to make some room. If anything interests you, let me know – there is almost nothing sacred in my shop, and none of it is crap. Acoustic Guitars: the Simon & Patrick Songsmith hangs in there, and an Epiphone Masterbilt AJ 500RE. It is nice to have an acoustic with onboard electronics again. Ukuleles: two Kala solid mahogany ukes, a soprano and a tenor. No electronics on these. Electric Guitars: I currently have two Japanese Les Paul copies: a 1980 Aria Pro II and a 1983 Tokai Love Rock with Burstbuckers. I also have a pair of Japanese Fender Telecasters, a faithful 1852 re-issue and what I believe to be a factory Keith Richards Micawber with a brass bridge and a humbucker at the neck. 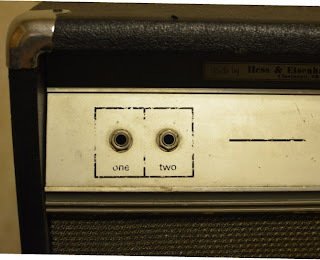 Guitar Amplifier: I only have one of these right now, a Fender Blues Junior III. What a sweetheart of an amp! Electric Basses:3 Japanese lawsuit-era Precision basses: a Tokai Hard Puncher, an Aria Pro II Precise Bass and a Greco Spacy Sound. Also on the P-Bass front is a JV era Fender 57 re-issue. There are also two ESP PJ basses, both custom-made for semi-famous artists. A 1980 Aria Pro II SB-1000. An Ernie Ball MusicMan Stingray Classic. And lastly, a pair of Sadowsky Metro basses (a JJ and a PJ) that I am especially eager to move along. Bass Amplifiers: Things are crazy here. There is the Ampeg SVT Classic with an 810 cabinet, as well as a 1970s Ampeg V4B and a solid state Ampeg B-15T Portaflex that I finally got around to getting repaired. And of course my trusty Genz Benz Shuttle 6.0-12T with a 12T extension cabinet. Effects: I still have my board full of Cave Passive Pedals and a Boss Tu-3 tuner, and I recently picked up an Alembic F-1X pre-amp that I am still monkeying around with. That’s it for now. Check back in September and hopefully the collection will be a little more manageable.